Let's face it: we all want to have our cake and eat it too! Artists have always been fascinated by food and capturing its essence in the form of paintings extends our enjoyment of food well beyond the final gulp. Nearly every culture on earth has produced elaborate artistic compositions using food as primary subject matter, some of the paintings dating back centuries. Preserving food in the form of art is a kind of cultural index. 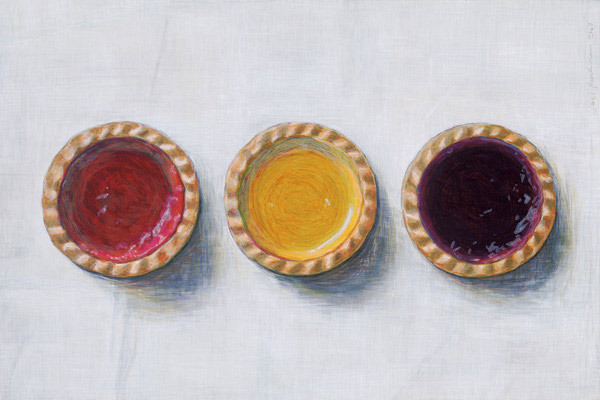 These paintings create a visual archive, a painterly historical record, of the foods we have loved and celebrated, decade by decade. With the rise of the food stylist in current lifestyle media, we have become even more accustomed to viewing food in artistic ways. 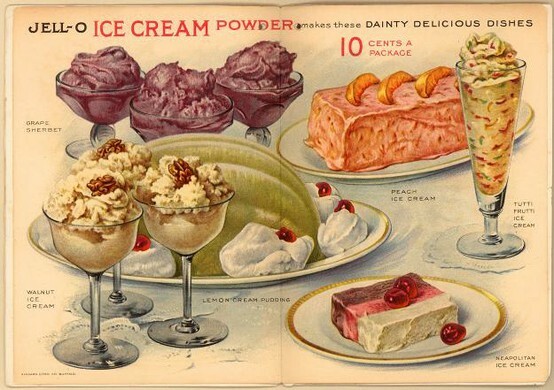 Beautiful photo spreads in magazines featuring tables laden with desserts and confections of all sorts can inspire the artistic imagination as well as the taste buds. 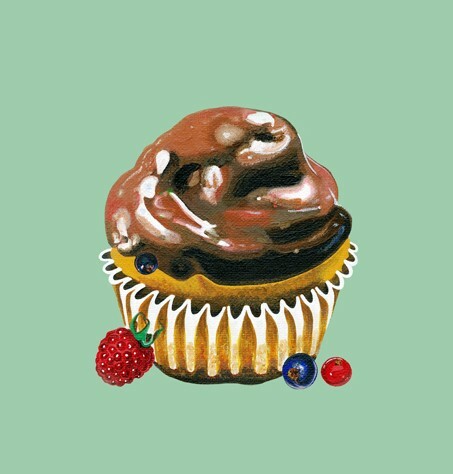 The artists featured in this post have all been lured by the idea of preserving delicious-looking desserts on canvas through their paintings. Whimsical, modern and colourful, 'dessert art' is a growing trend in home décor and some of it is actually quite collectible. 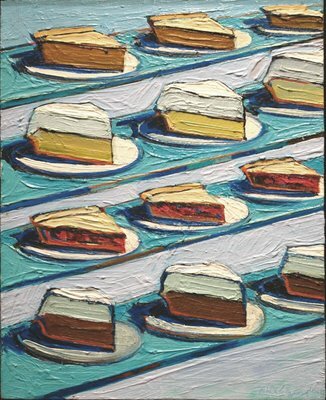 American artist Wayne Thiebaud, for example, was a prolific painter of cakes, ice-cream cones, pies and other desserts. 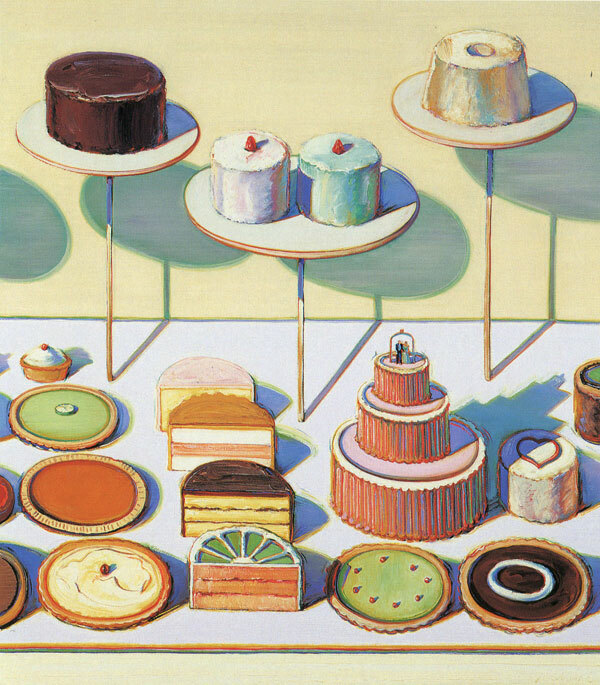 Considered to be among the most recognized American artists in the 1960s Pop movement, Thiebaud's work is featured in many U.S. galleries alongside Pop contemporaries such as Andy Warhol and Roy Lichtenstein. 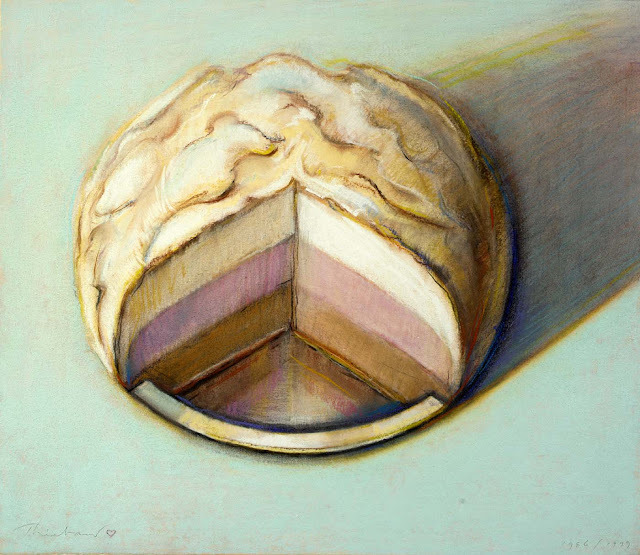 An original Thiebaud could fetch tens of thousands of dollars on the market today. 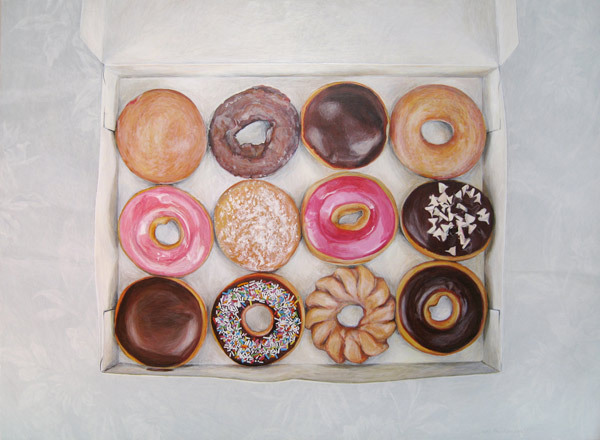 Current food artists, such as British graphic designer Joel Penkman and Toronto painter Shirley Radebach, sell their dessert paintings for several hundred dollars each. I urge you to visit their galleries on Etsy for a further look at their creations. You can find the links below. Food art can spruce up any room in the house, especially the kitchen where their bold colours and lighthearted exuberance can brighten and enhance the space. 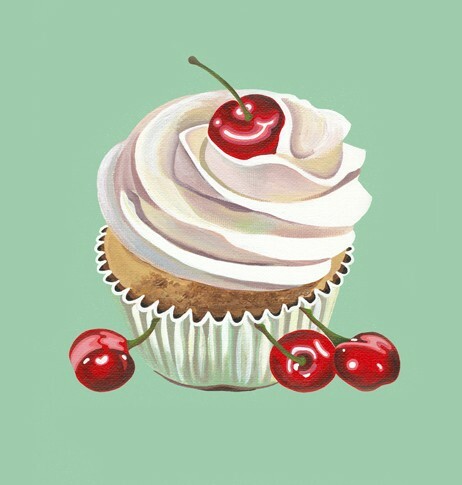 So, when it comes to wall space, remember to save room for dessert! The paintings above are by artist Joel Penkman. You can view his gallery here. 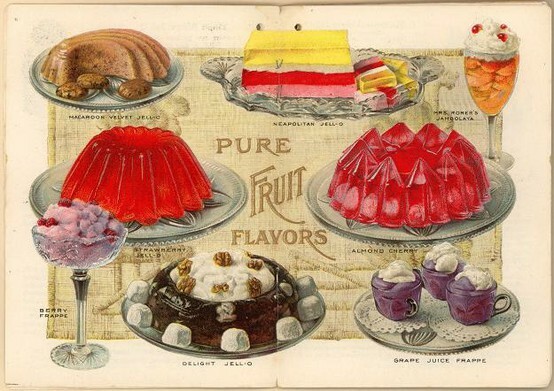 Vintage Jello dessert ads, such as these two above, were common in domestic manuals from the early 1900s, gorgeously illustrated to convey the final product of a recipe before the advent of the photograph. Inspiring in their own right, these ads would make wonderful, large-scale prints. 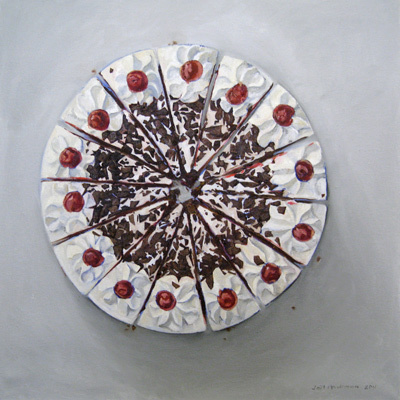 The three paintings above are by renowned American Pop artist Wayne Thiebaud. Toronto painter Shirley Radebach sells her prints for very reasonable prices. Click here to see her small gallery.